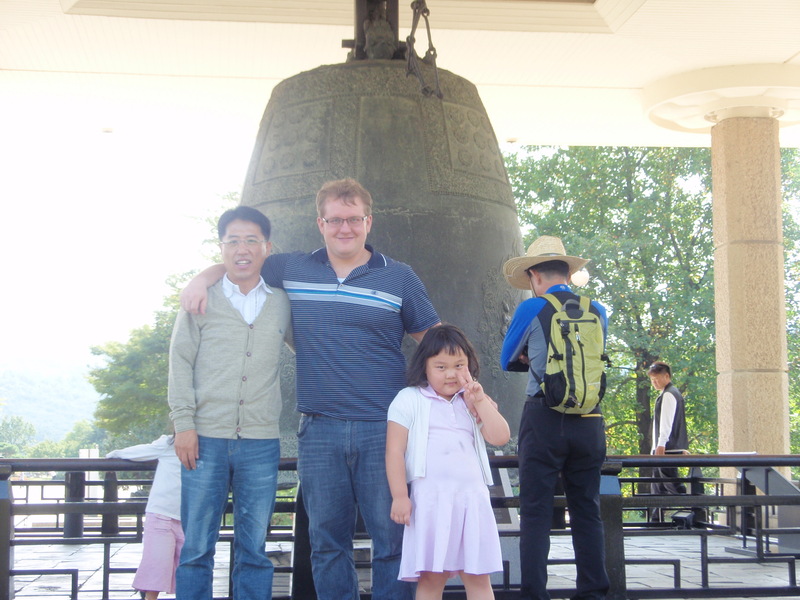 South Korea was, and still is, a means of escape for me. On a practical level, it offered me a ticket out of my depressing neighborhood in Nevada (U.S.) with the meth lab across the street. On a slightly higher level, it released the contradictory pressures I felt as a refugee between two “racial” categories – educated white and white trash. I couldn’t really join the first group because I didn’t have enough money and I didn’t want to join the second because that’s effectively a death sentence for an ambitious person like me. In Korea, I rightly assumed these identity tags would fall away and leave me the space to carve out an international, upwardly mobile niche for myself and allow me to play to my greatest strength – the willingness to adapt. That attitude, I believe, is what made my transition from the deserts of Nevada to the megacities of South Korea so satisfying and now, such a huge part of my identity going forward. When I arrived in Korea in 2008, I found that roughly 50% of what I saw looked familiar and 50% like the product of a Martian civilization; I could walk into a totally familiar 7-11 and walk out with peanut-crusted squid jerky as well as a box of “placenta essence masking.” I found this incredibly exciting. The language became this wonderful puzzle, the 2,000 years of history a playground, the whole new cast of cultural heroes (like King Sejong) and villains (like the Japanese occupiers of 1910-1945) a great opportunity to look at the world differently. Korea, by being so different, almost forced me to broaden my perspectives and for that I am very grateful. 1) How do you define yourself racially or ethnically and why is it important to you? Please tell us about the racial makeup of your family if you were adopted or come from a colorful family. I define myself as white, though it’s not important to me at all. Frankly, the notion that there’s an ideal of whiteness that I should pursue is insulting. I am the product of my human agency, and reducing all my choices, all my work, all my individuality to an accident of birth like race is to treat me like a plant or deep sea sponge – a passive organism defined by nothing more than chance. It is to deny my humanity. My family name is from Spain and I believe most of my ancestors are from Europe. 2) Where do you live? If you have ever moved, whether to another city or the other side of the world, please tell us when and where, and the ways the cultural differences between the places shaped or made you think about your identity. a) Immigrants. Mostly from Mexico, mostly illegal or illegal until recently, these people were omnipresent in Reno. When I first arrived in Reno from Central California I was 11 years old, patriotic and conservative, which means I despised this group for invading “my” country and stealing “my” jobs. My attitudes, to say the least, have evolved on this matter. b) The rural poor. Mostly white, although sometimes Hispanic and occasionally black, these people are Reno’s underclass. The really scary attitudes in this class of people are the same attitudes that scare me about black ghettos in Sacramento or Los Angeles – a deification of ignorance, taking real pride in one’s race and deriving identity from said ancestry. c) Rich people and the middle class. These people are, by virtue of their money, above racial classifications. If you’re Asian or Hispanic, you will fit in here without difficulty. You can even be black in this social setting, so long as you have enough money. 3) How diverse was the neighborhood and school you grew up in? Some of them were very diverse, some of them were lily-white and, if you include my graduate school, overwhelmingly Asian. 4) When did you first become conscious of your race or ethnicity? Please describe the context or a moment when you noticed you were different in color or language. It could be a scene with strangers, the park, school, work. Could have been subtle feelings you recognized or a blatant attack of bigotry. If it was a season or chapter in your life, tell us the impact it had on your sense of self, confidence, or emotional development. Can you share a bit about the fear, loneliness, longing for acceptance? I made friends with a black kid in the third grade and this offended his mother, who accused my new friend of selling out. At the time, I took this to mean it was offensive to people of other races when a white kid tries to befriend them. I just wrote it off as my friend having a dumb mother. I’ve always been pretty comfortable ignoring or breaking rules I consider stupid. I should explain what I think is the central advantage of being white – it doesn’t mean anything. I can be straight or gay, conservative or liberal, a businessman or a pimp and nobody is going to blink. White pride, to the extent it exists, to me implies shameful affiliations like the KKK, Neo-Nazis or whatever depressing nationalistic rally Vladimir Putin is currently hosting. I know I said this before, but if someone were to make it clear they were accepting me because I’m white, I’d be offended. This is why [insert ethnicity here] pride has always baffled me. Why the flaming hell would you want all the expectations and limitations that a racial identity puts on you? Why would you want to stereotype yourself? 5) Do you consciously gravitate to certain company? Are you more comfortable, more at home around people of your own ethnicity? Have you observed a social or behavioral tendency in your own people group you would rather not perpetuate? I gravitate towards people who have the strength to reject the easy, cheap identities that come from the accidents of birth. If I think you are stereotypically white/Asian/black/Hispanic/whatever, I probably won’t respect you. If, on the other hand, you have the strength to build your identity from an act of will, I will be very interested in your company. I’ve found strong people of that type come in all shapes and sizes. There is a social tendency in my national group, particularly white people, that I wish would go away. That is the assumption that, simply by virtue of being an American, everybody should listen to you. I call this idea inevitable superiority and I hate it. You were not born special, you were not chosen by God or anybody else, you are an American/European/whatever because your Mom and Dad decided to conceive you within the arbitrary boundaries of America/Europe/whatever – nothing sacred about it.. If you want to be special, earn your specialness and stop expecting people to listen to you just because of your passport. 6) Are your most meaningful relationships with people of your own ethnicity? Yes, and for obvious reasons. The two most precious people in the world to me are both members of my immediate family. 7) How much does racial affinity give you a sense of belonging compared to a shared faith or interest? Think about the groups you are part of: writers, homeschoolers, mothers, hobbyist, artists, colleagues, church. Would you rather spend time with those who share your cultural food, tradition, and values or those who share your interest or mission? Where do you feel the greatest ease and connection? The idea I would need to use my race to find a community is pretty offensive to me. I’m a writer, thinker, educator, basketball fan, shade tree mechanic, second language learner and about a million other things before I’m white. And Korean food is waaaay more delicious than most American food. 8) Do you consciously try to keep yourself or your family active in diverse circles? No. It happens naturally when you treat people as individuals and not as representatives of their particular birth accidents. It also happens pretty easily when you live in a foreign country and make most of your friends from the local community. I guess I only consciously do this in the sense that I try to make friends in Korea who aren’t going to leave after a few years – most of whom are Korean. 9) How did you set out to secure a sense of acceptance and belonging in social contexts, especially if you have faced hurtful experiences? I rejected the accidents of my birth and presented myself as a creature of will. I expect to be treated as an individual. I expect to be accepted for myself and not as a representative for some identity group based on chance. I extend the same courtesy to everyone I meet. This has proven invaluable in Korea. I can’t tell you how many times my Korean friends or acquaintances have said “you don’t act like an American, you just act like a person.” I’m very proud of that. 10) Do you feel it is not fully possible or even imperative to shed all racial stereotypes and judgments? I think the best way to defeat the effects of race or tradition is to do what the Romans did – move all around the world, borrow the customs and ideas that work and marry the locals. The trade-off between advancing as a human species and protecting the purity of one’s blood or traditions is a no-brainer to me. This might sound like I’m advocating imperialism. Imperialism is the belief that Culture X should impose its inevitably superior ways on the inevitably inferior Culture Y. I don’t accept this at all, mostly because I find the idea that humans are destined, inevitably, to be anything, bothers me. I don’t like it because it’s an attack on our nature as self-determining beings. My belief is that we should stop treating cultures and traditions as sacred or even innately valuable and start treating them like tools. If my American culture is a 5/8th inch wrench and I need a 14 mm socket of the type they make in South Korea, there’s no reason for me to agonize about how I’m betraying the proud heritage of 5/8th inch wrenches – I should just go get a different subset of 14 mm cultural norms. 11) What has struck you the most in working through this exercise? Any closing thoughts on race and identity you would like to share? It made me sad. A lot of people spend a lot of time fighting to preserve their proud racial identities. It’s like watching emphysema patients fighting over a carton of cigarettes. This entry was posted in Stories From Around the World and tagged America, Bigotry, Community, Culture, Europe, Life, People, Racism, Relationships, United States, Wplongform. Bookmark the permalink. Hi Ben! It was enjoyable to read your post. Thank you for sharing. Could you explain why you chose South Korea when you decided to move? I am a bit confused as to your stance on culture/race. You seem to engage in a healthy adoption of the Korean culture including food, heros, language, and other cultural norms. Even so, you insist that cultures and races are meaningless. If this is so, why have you adopted so many Korean ways? Would it be possible for you to address this apparent paradox? Simpel Me posted on A Holistic Journey “The Race: White in North Africa, Part 5” and navigator1965 made a comment regarding social narcissism that seems to me to be directly related to the “inevitably superior ways” you mention in your post. Can you comment on this? Is it possible that the reason for your rejection of race/culture in general is a reaction to the American culture specifically? Your comment “… ‘you don’t act like an American, you just act like a person.’ I’m very proud of that.” seems to suggest so. Can you elaborate on this? Thanks again for your post Ben, it was very honest. You have certainly made me think. Thanks for taking the time to comment on my post. I picked South Korea because I had an uncle who recommended it and because I thought the language would be valuable in the future. As for my stance on culture and race – hmm. How should I say this. I am not anti-culture, I am anti-culture-as-something sacred. I think our cultures evolved to help us survive, just like tools help us survive. And just like it would be ridiculous to protect the “sacred heritage” of a worn-out drill, I don’t think there’s much sense in protecting the “sacred” nature of a cultural heritage. This, I believe, is why it was so easy for me to slip into a very different culture – I didn’t see myself as a representative of the West and I didn’t see my adjustments as betrayals of anything. I, to re-use the metaphor, simply put aside my 5/8th inch American culture and picked up a 14mm Korean tool. Race is very real in a social sense, but it’s also arbitrary, fluid and always accidental. Nobody chooses their race. I define human beings as animals that choose. As such, if you share my assumptions, defining a human being on the things they can never choose, like race, is like trying to define a refrigerator on how fast it can fly – it doesn’t make sense. However, very few people share my assumptions on this matter. I don’t think I’m reacting against the US. I mostly like the US and I see, almost every day, positive facets of US culture spreading in South Korea. There are things I much prefer about Korea, but my stance against sacred cultures and racial identity isn’t driven by animus. Simpel Me’s post was excellent! I was fascinated by the dynamics involved in his identity, they are certainly more complicated than my own! I don’t want to speak for him or any other posters, but I suspect you are right with your assumption that “inevitable superiority” and “social narcissism” are pretty similar. I define “inevitable superiority” as the belief that, simply by being born, some person/people are inevitably better than some other person/people. It is the underpinning of any royal family system, any “chosen people,” any apartheid. There are a lot of Westerners who visit Korea convinced they are inevitably superior to the locals and I kind of want to punch them. Ben, a rich post well presented. I appreciate that you’ve staked your ground (literally, actually, in Korea!). It’s very cool that you wanna punch Westerners who go out there with superior airs. You tapped something that came to me when I first read your post. “If we share your assumptions….” Your post (position on race and identity, how they can be independent of each other) rests on your convictions, which rest on your worldview and assumptions. I happen not to share your worldview, and so wouldn’t attribute my race (my life implied there) with the word “accident”. ” I am the product of my human agency,” and such beliefs I don’t share. At the same time, you bring to mind my post Smarts, Praise, and the Myth of Self-esteem (which I won’t link here. It’s in the Top 10 if you choose to go there) where in the comments I point out that we cannot tie up our sense of worth with things we have no control over and therefore can take no credit (or blame) for: innate ability, intelligence, beauty. Your line of thought on race would fit right in. As to their being nothing sacred about our race, it depends on how we mean that. With the imprint of my God and His (purposeful) design on every aspect of my being, every bit of me IS sacred. But that is NOT a declaration of value or merit over against anyone else. We all obviously are different in color and hue the world over, but that simply does not mean anyone is superior which is where we trip. It was neat to see surfacing in your post what I’ve observed out of this series so far, that how we approach life and view ourself very much impacts and drives our view on race – not just the other way around, which was the initial question I posed everybody. I planned on bringing this up in a future post. Lovely read. I too lived in South Korea. During my time there I was referred to as Korean. Many were shocked that I embraced assimilation. I learned language, culture and always prepared the food. Even with memory loss, Korea has a warm place. I call it a second home and miss it dearly. Hi Ben. Apparently your assimilation to Korean culture has been successful. Have you encountered any xenophobia and if so what were your reactions or responses? I’ve encountered some xenophobia, but not much. There have been dating opportunities fall through because I don’t pass the race test. This doesn’t bother me very much because, well, there are other fish in the sea and getting upset isn’t going to do me any good. It’s also a pretty good indication that the person whose race-test I don’t pass probably isn’t going to be the sort of person I have much in common with anyway. It’s pretty common for people to tense up when they first meet me, but that’s almost always because they assume I don’t speak Korean and they don’t feel comfortable speaking English. I feel this is the source of most “Koreans are racist” stories because I noticed it a lot when I first arrived and couldn’t speak the language. Once I achieved a modicum of communicative competence, this problem largely vanished. Since very few foreigners bother to learn the language, very few ever get past this tense, “I don’t want to sound stupid speaking English” phase. Wow, what a fascinating read! I truly admire your perspective and believe our world would be a better place if more people felt the way you do about race identity. Great writing, thank you for sharing! That’s an important observation. If we go back far enough we will find original parentage common to us all so there’s really no excuse for racial prejudices and as you point out those who cry discrimination are sometimes the ones who have that attitude too. Thanks for reading, Ian. Discrimination isn’t rational, but it is real. I just think we can get a competitive advantage by making our own, choice-based identities. Having lived and worked in Asia for 30 years one picks up on the cultural things that are so important to know and honour. I have been horrified at Westerners who make their first trip to Asian countries without taking the trouble to read the “do’s and don’ts” which are readily available in book stores now. Sometimes it may be a superiority complex, but most times its just ignorance. Either one we should be ashamed of. However to balance things out I have seen Asians travel to the West expecting the culture will be the same as the one they left and their behaviour can be offensive too. I think with our world becoming a global village we will slowly rectify these behaviour traits. “superiority complex, but most times its just ignorance.” The first often comes from the second. And I agree that expectations play a big role in the way we approach new situations. My guest post on Holistic Wayfarer’s page. I am interested in your religious take on my article. When I said I was a product of my human agency, I meant that my free will is the operative part of my identity and, indeed, what being human means to me. As for the question of God’s role, that’s another very interesting question I’d like to explore in the future. Not sure how to answer, Ben. Bc it’s such an open-ended question. My point was simply that your worldview comes across clear, is so clear and strong in fact, that it defines and constrains race in the power it might wield to affect your self-perception and relationships. And that paradigm of the world is very much different from mine which has God at the center of my world, the way we orbit the sun and not vice versa. But that is not to say – does not mean – I lose my identity, as I explained in Part 3 of the series. I am most fully myself in my knowledge of God and He gives meaning to all parts of me. Loved this submission, Ben. I identify with so much of it. Perhaps there is an unconscious “luxury” of being white, but my race means nothing to me. Such excellent comments here by Paul and Madam Wayfarer, too. “Perhaps there is an unconscious “luxury” of being white. Wow, Nav. So well put. Have to disagree. We need not throw the baby out with the bath water. We don’t have to be dependent on race to define ourself but the different elements of our makeup are all precious parts of the whole. I think that’s exactly what the luxury of whiteness is – zero expectations. If somebody tells you or me to do something because “think of the white race,” we’re probably going to laugh. If someone tells a black kid to do something because “think of the black race,” that actually means something. Wow, Ben. Illustrative. You made your point, though arguably the luxury could be taken to mean you in fact go around with expectations – of respect, of a hassle-free life (socially, that is). That’s certainly part of it, too. Unless I decide to join the KKK or something like that, an attack on whiteness really doesn’t mean anything to me. Part of that is the expectation of hassle-free living, part of it is the fact that “white people” is such an expansive, amorphous thing that is really loses the power to impose expectations. I enjoyed reading your post very much. Thank you for sharing all you did so honestly and I wonder if I might share my observations in reply? As a white Brit who lived on the Central Coast of California for the best part of 20 years (once married to an American with HIspanic and Spanish heritage) I find your comments in question 2 very interesting, particularly 2 a) about Mexican immigrants in Reno and your feelings towards them when you first moved there as a boy. I would say this applies very much to California too. I grew up as white and as middle class as they come in 60s and 70s England and had absolutely no thoughts about race either way. When I moved to CA in the early 80s, I was shocked to hear these kind of comments and the way these ‘illegals’ were looked down upon, while they worked in the hot fields and stood in line in the the streets of LA at the weekends waiting for someone to hire them to work on their house or garden. I had never experienced anything like this. The fear that the were ‘invading my country’ and ‘stealing our jobs’ was everywhere it seemed yet, in my mind, they were the ones prepared to do these jobs and be paid by those who were happy to employ them, illegal or not. My eyes were opened to a way of life that I never knew existed. They do say that travel broadens the mind and I have found that to be so very true. Thanks again Ben. Sherri, thanks for your thoughts. I’m glad you enjoyed my article. I have another article I can link if you’re interested in my theory to explain the common anti-immigrant feelings – if it’s okay with The Holistic Wayfarer, of course. In any case, I changed my mind when I started studying economics. The entire basis of my assumptions – job stealing and benefits sponging, turned out to be completely unsupported by the science. This made me question my attitudes and, after reflection, I’ve become a big fan of immigrants everywhere. In fact, I think I could make a pretty good case that that average immigrant is generally a better person than the average native. If you don’t mind my asking, I wonder if you know people back home who have similar anti-immigrant feelings towards Muslims? You can post links, Ben. =) Gotta run. Hi again Ben and yes, do please send me your link, I would be very interested in reading it. I like the sound of your good cause! Here in the UK things have changed a great deal since I was a young girl growing up here. Immigration is a huge cause for contention since we have many immigrants come into the country from all over Europe, places like Romania, Bulgaria, Hungry and Poland particularly. The very same attitudes of ‘stealing our jobs and sponging on benefits’ prevail which I think is wrong. I know a number of Korean-Americans who have gone or moved there, some good friends. One did a semester in Oxford. Said the Londoners are way smarter than Americans. This article is designed to be uncomfortable, but I think it’s a good explanation of how anti-immigrant animus works. Actually, I think it applies to most things where patriotic feelings are involved. You have to click the links at the end to get all the way through. Have I told you how much I love these stories? I guess you’re talking to me? Thought I’d see a comment addressed to Ben. =) I’ve really appreciated your support of this series! It’s been amazing. Korea is a paradise for White men, much like the rest of East Asia. They worship Whites, and despise Blacks, which adds to the appeal for non-Black foreigners. Black people (heterosexual young men especially) should avoid East Asia. I’m guessing you visited in a military capacity? Anyway, yes, it’s a disadvantage being black in Korea. The two things Koreans think of when they see black people are gangster culture and the military (heavy drinking uneducated 19 year old males who think they’re badass) . The former is scary, the latter is perhaps the world’s most annoying demographic group. There’s a reason I go so far out of my way to NOT look like a soldier. The bad news is that being black means people will be afraid of you at first. The good news is that these feelings aren’t very deep. African people from Africa typically do fine here. African Americans who go out of their way to not look like soldiers or extras from a 50cent music video typically do fine. People of all races, especially black Westerners, who don’t bend to the culture or try to continue living like they do back home are going to be miserable. You might want to be careful with broad, insulting characterizations of entire continents. Your ability to not act like an American is understandably something to be lauded, since I appreciate the same compliment when it is thrown my way. My question is: Isn’t your un-Americanness to the Koreans you meet mostly attributed to moving there on your own rather than with anyone else? In other words, had you come as part of an academic program or with a family, you would have been required to interact with people that share the same cultural vernacular. Thus, limiting the time you spent integrating and learning about Korean life and culture. Moreover, had you been part of a family unit or a group of any sort, you would have been inherently less approachable in numbers, lending outsiders to make assumptions about you. If nothing else, they wouldn’t know that you have Korean language skills because you wouldn’t be speaking Korean with fellow Americans, obviously. It’s not that hard in South Korea to stay in the foreigner bubble. It’s just not that hard to hang out at foreigner bars, go on English language tours of landmarks and make Western friends. I do those things, too, just not exclusively. I might have integrated slower if my family had come with me, but I also might have done it quicker. I know I’d feel responsible for helping them function, at the very least, and that would probably motivate me to study more, even if I didn’t hang out with Korean people as much. Being a foreigner is fun. Being obviously out of place means I get to build my “me” from the ground up. Thank you Ben, for that great blog. You were very candid and introspective. I really enjoyed that. I’m glad you enjoyed it. This was an excellent topic Holistic Wayfarer created and I had fun answering her questions. Glad the mental gymnastics was FuN. Ha. As a fellow American living in Korea, these words were really refreshing to hear. I’ve only been here for less than a year, but something I’ve learned so far from my experience is that my identity is much more flexible and malleable than I previously understood in the states. I guess it’s the everyday encounter that provokes me to relfect on who I am and what makes me different. Rather than coming to see myself as the American who will always be the “other”, I’ve enjoyed the creative possibility of living in Korea…as a process of adaptation and self-buiding. I don’t like living in a box either, and there are many things I also appreciate about Korean people and culture, so I’m enjoying the challenge of trying on new ways of relating and interacting with people. I also noticed in your comments you mentioned the “perceived racism” from a foreigners perspective to be largely connected to language. I’m still at a relatively low level in my Korean, but I can make sentences, know a lot of phrases, describe my weekend, etc…and even this has made my interactions with Korean people here much more harmonious and smooth. I completely agree. Anyway, fascinating and inspiring read. Keep enjoying Korea!! There’s a word in Korean I think really applies well to the process of acculturating in Korea – 눈치 (Noon-chee). The literal meaning is “measuring by eye” and it refers to the ability to read and adapt to the people around you. People with 눈치 tend to be flexible and open to new experiences. People without it tend to struggle in Korea and, in my opinion, that’s because they are too busy defending the identity they were born with. And yes, language is huge. Honestly, even if you’re low level, trying a making a ton of mistakes makes 99% of people feel more comfortable. When they try to speak to you in English, at least they know they can also screw up without getting judged. Thanks for the response and the tip! I actually know about 눈치. That’s a great point, I am refining my ability here to think and relate nonverbally. Also, thanks for the language tip. I can write pretty well, but I am still a bit shy when it comes to speaking. I can tell a lot of people here are also shy and uncomfortable with their english. That’s a good point, I can use that shared discomfort to my advantage in making relationships. You know I’m swAmpeD if I don’t response right away, Ben. =) I get such a kick out of hearing this coming from a white person, I must say; I never had even thought or known of the literal meaning of noon chee. Koreans are immensely fond of any nonnative attempting to learn the language. Again, a very difficult tongue I say – in some respects. That’s definitely been my experience. 99% of the time, people are more than happy when a foreigner tries to speak, even if they make a lot of mistakes. The 1% that aren’t fine tend to be pretty bitter folks. I’ve seen the same thing in the US. Most Americans are pretty nice to, for example, Japanese tourists who murder every L/R and do to grammar what Russel Crowe did to the singing parts of Les Miserable. Wonderful, Evan. What are some things you appreciate about Korea and her culture? I’d say the things I appreciate most about Korea are the people, their passion and warmth, the rich history and of course the food, but when I first read your question I basically wrote an essay..haha. So I ended up writing a post today about what I’m learning in Korea and the things I’m gaining here. I talk about the frustrating/challenging aspects as well as the things that come easily. Just hoping it’s not too negative in tone. I love my life here, but I do find aspects of it very challenging. That’s wonderful. I love it when this happens, when readers go running back alit with posts in their head. =) This is not so I can have exposure on your site. (Honestly, I don’t need it. Just so you’re know that’s not what I’m after) but seeing that you referenced Ben without naming him as well, blogging protocol is to link back to bloggers who inspired/triggered thoughts for your post. Letting you know just in case you weren’t aware and bc it woulda been nice for you to link back to Ben for the ideas you guys had exhanged. Great post, Evan. Oh, thank you! Sorry I didn’t mention you two, I wasn’t sure about that. Should I address you and Ben by your blogger names? Again, sorry about that. Thank you!